John Reaf watched the students crowding through the door of his U.S. History class, smiling at their faces, which reflected a variety of ethnic backgrounds. The first day of school—always a challenge. How to make a good impression yet still set proper boundaries? The veteran teacher felt ready, though. He had lined up the desks in neat rows and placed a new textbook on each desktop. The noise of a desk scraping across the floor caught Mr. Reaf's attention. Two of the boys had shoved each other in the second row, trying to sit by a particular girl. Mr. Reaf smiled to himself. He'd set up a seating chart once he got to know them. Slowly the remaining students found seats, leaning across to each other, laughing quietly and casting their eyes up at him. None of the students opened the new textbooks. Feeling a bit intimidated, Mr. Reaf looked down at his desk for his roll sheet. On top of it was the document that the social studies department chair had handed him that morning. He glanced at the title: National Council for the Social Studies, Disciplinary Standards, Teacher Expectations. Enable learners to develop historical comprehension in order that they might reconstruct the literal meaning of a historical passage; identify the central question(s) addressed in historical narrative; draw upon data in historical maps, charts, and other graphic organizers; and draw upon visual, literary, or musical sources. “Noble goals, high expectations,” he thought. “Well, that's what we're supposed to set nowadays—high expectations.” He looked out at the waiting faces. “Good morning, class. My name is Mr. Reaf. I want to welcome you to your American History class. This is my 17th year as a teacher. Yes, that's right. I have taught longer than most of you have been alive. Over my career I have also taught English, P.E., science, and health, and coached a number of sports. As a coach I never tolerated any misbehavior on the field. I'm sure that will not be a problem here. The students stared blankly at him. None of them opened their textbook. “Open your books, please. The beginning of Chapter 1,” he repeated. All smiles disappeared. Several boys slouched in their seats. One or two of the girls began turning pages. He heard bubblegum pop. “First boundary set,” he thought. Mr. Reaf began calling the roll. Students answered as he called their names. Having marked only two students absent, he looked back up at the class. Most were staring into their books. “OK, let's see what we learned.” Mr. Reaf opened his teacher's edition to page one. He glanced at the questions in the margin. No answer. No hands were raised. Mr. Reaf glanced back down at his roll sheet. Wide-eyed, Carlos Hernandez looked up at the teacher. “Oh, my,” thought Mr. Reaf. “Here we go again. How many of my students can't understand the textbook?” He and the boy stared blankly at each other. They sighed in unison. Sound familiar? Many teachers today are finding more and more students unable to comprehend their textbooks. Whether they are nonnative-English speakers or just struggling readers, they are not able to read the curriculum materials. And because most social studies teachers have had little or no training in teaching reading, the inability of middle and high school students to get information from texts becomes a formidable problem. The goal of social studies is to teach students to read and think critically so that they will become informed and engaged citizens. What, then, can social studies teachers do to help struggling readers in their classrooms? To answer this question, it is necessary to answer two prerequisite questions. First, why are social studies texts so difficult to comprehend? And second, what skills and strategies do students need to become expert readers of history? What exactly is it that Carlos Hernandez needs to be able to do? The answers to these questions point to a host of strategies that social studies teachers can use to help all students glean more from informational texts. Each chapter in this book provides a variety of practical, research-based strategies to help students become engaged readers and civically responsible adults. But first, some background information may be helpful. Why Are Social Studies Texts So Difficult to Read? There are a host of reasons why students find social studies texts hard to understand. One of the chief reasons has as much to do with today's students as today's textbooks. Many students have a poor attitude about the subject of history. They feel that studying about “old events and dead people” has little relevance to their lives. Recent brain research has shown that a student's emotional attitude has a profound effect on engagement, learning, and retention (Jensen, 1998; Sousa, 2001; Sprenger, 1999). Consequently, when social studies is taught only in the context of past events and not related to today's issues, teachers fight an uphill battle for students' attention. When choosing textbooks, teachers should look for texts that make connections with present-day events and also include activities that actively engage adolescents. Students may have no prior knowledge about the concepts, such as foreign cultures, people, places, and previous eras. Prior knowledge is a key determinant of student engagement and comprehension. As Alexander and Murphy (1998) note, “Existing knowledge serves as the foundation of all future learning by guiding organization of representations, by serving as a basis of association with new information, and by coloring and filtering all new experiences” (p. 28). Social studies texts cover a large amount of information. A typical middle or high school textbook includes 800 to 1,200 pages of facts, anecdotes, statistics, questions, activities, and graphic images. Students have difficulty discerning which concepts to focus on and which are the most important to retain. Because of the large amount of information, teachers may feel pressured to cover material quickly and superficially, which hinders student engagement, comprehension, and retention. Social studies texts are filled with abstract “-isms” about economics, religion, government, and culture. A student who doesn't understand key concepts such as imperialism or Buddhism can't understand the main ideas of a chapter. Social studies texts also contain a great deal of academic vocabulary—content-specific terminology with meanings specific to history or government. For example, when students read in Section 10 of the U.S. Constitution that a state may not make gold or silver tender, they may think that states can't make money that is soft or easily crushed. Students need time to learn the multiple meanings of terms. Through multiple exposures to words, they develop sensitivity to their meanings (Stahl & Fairbanks, 1986). Students who come from minority populations may feel disengaged from a country's history and politics. Within some texts, minority students may see their cultures described only in negative ways, such as African Americans pictured as slaves with no mention of the rich African culture that they possessed when they arrived in America. Social studies texts, tests, and standards often require students to analyze and synthesize much information—a skill that they may not have been explicitly taught and that assumes comprehension of the material. The ability to understand and summarize the literal narrative in social studies textbooks is related to a student's age and reading ability. Britt, Rouet, Georgi, and Perfetti (1994) found that students in 4th through 6th grades gave one of three types of summaries of their reading: a simple list of facts, a substory rather than the main idea, or a full recounting of the main events. Younger students more often recounted a list of facts or were sidetracked by a substory that had been included to enliven the text. However, older students with greater reading ability could provide a better representation of the text's narrative structure, both recounting the main events and showing the causal linkage of those events. Readers who are less able may also struggle with the wealth of visual information—such as maps, graphs, and charts—in social studies texts. Hegarty, Carpenter, and Just (1991) note that “when the text is accompanied by a diagram, the comprehension process is more involved because the information that readers have to integrate is presented in two different media. It takes added attention and flexibility to integrate information from the narrative, linear text with material presented in graphic forms” (p. 652). With so many factors affecting the readability of social studies texts, teachers such as Mr. Reaf see a wide variation in the comprehension attained by their students. Struggling readers often simply don't get the literal meaning. Other students may be able to read fluently; however, they read the text as a set of facts rather than as a writer's reconstruction of a set of events. These “mock readers,” as Wineburg (2001) calls them, read to gather information rather than reading critically as a historian. Without literal comprehension, however, a student cannot attain even the level of mock reader. Let's discuss the differences between a struggling and a fluent reader first. Then we'll look at the characteristics of students who can get the literal meaning, but who ignore the “human subtext” of a writer's assumptions and biases. Fluent readers have acquired a variety of comprehension strategies that they bring to bear on any text. Fluent readers not only have these strategies, they also are aware of when to use them and which strategies to use. Fluent readers are in charge of the process, monitoring how they read and adjusting to ensure success (Alvermann, 2001; Duke & Pearson, 2002). Reading experts speak of the sequence of instruction in reading as a three-part process. A fluent reader applies reading strategies to a text before reading, during reading, and after reading. Before fluent readers delve deeply into a text, they use a host of skills and strategies to promote comprehension. Using text features and graphics, fluent readers make predictions about the content and activate their background knowledge to impose meaning upon the print. The chart in Figure 1.1 compares fluent readers with struggling readers, such as Carlos, as they prepare to read. • Sees reading as a difficult task filled with failure and expects to gain little, if anything, from the task except frustration and embarrassment. • Sees reading as an opportunity to gain knowledge about the world and to feel more self-secure in school and among peers. • Doesn't possess prior knowledge about the general topic or doesn't connect existing knowledge with the text. • Possesses and activates relevant background knowledge from previous reading, viewing, or conversations about the topic. • Doesn't try to understand the text until questioned after reading. • Uses strategies throughout the reading process to construct meaning. • Reads one word at a time or groups words together but not necessarily in meaningful phrases. • Groups words in meaningful phrases noting punctuation and transition words that show text structure. • Doesn't possess background knowledge of abstract terms often used in social studies texts that describe government, economics, culture, or religion, such as colonialism or Buddhism. • Possesses background knowledge of abstract terms often used in social studies texts from previous years of wide reading. • Doesn't preview the text to note such features as headings, subheads, vocabulary words in bold type, information in the sidebars, pictures, maps, graphs, and charts. • Surveys textbook features to understand the context of the reading task and to begin setting purposes for reading. • Begins reading without predicting what the text might be about, doesn't plan what to read in what order, and doesn't know on what part of the text to focus the most attention. • Predicts the text content by surveying the text features and then plans how and what to read in what order. • Begins reading without a purpose other than decoding for meaning. • Begins reading to answer questions about the writer's ideas, purposes, and biases. Once fluent readers begin reading in earnest, they add another set of skills and strategies to promote comprehension. These readers continue to use text features and visual information to predict and connect to content, but now they begin monitoring their comprehension; determining key ideas; asking mental questions about the content; noting differences and similarities; visualizing people, places, and events; rereading what is unclear; and, often when reading school texts, taking notes to aid retention. Figure 1.2 compares the skills used by a fluent reader during the reading process with those lacking in a struggling reader. • Possesses few, if any, decoding skills beyond basic phonemic awareness. • Possesses and applies a variety of decoding skills, such as context clues and structural analysis (word parts and roots). • Identifies words individually or in small clusters without using meaning to group words into larger comprehensible units. • Reads fluently by using punctuation and meaning to group words into larger phrases that make meaningful statements. • Skips unknown words and doesn't reread to decipher their meaning. • Skips unknown words but monitors comprehension to see if the word's meaning is critical, and if it is, returns to the word to apply comprehension strategies. • Doesn't recognize that informational texts have different structures than narrative fiction and consequently doesn't use these structures to aid in comprehension. • Recognizes the signal words that show various text structures, such as cause/effect, problem/solution, comparison/contrast, and sequence, and uses these to aid in meaning. • Doesn't stop to visualize descriptions of important people, places, and events to help “see” what the text is stating. • Visualizes important descriptions and constantly tests these mental pictures against what the text is stating. • Ignores maps, graphs, charts, and other important visual information. • Understands that visual information often restates the information in the text and uses this information to check for comprehension. • Possesses few, if any, “fix-up” strategies, such as using context clues, text structure, structural analysis, or visual information, to apply when comprehension is lost. • Possesses a variety of “fix-up” strategies and applies them appropriately when comprehension breaks down. • Reads through text once, and if comprehension is lost, either continues “reading” or quits altogether. • Monitors comprehension, recognizes where and when comprehension is lost, and rereads for clarification. • May retain only substories presented as colorful additions to enliven the text rather than core events (Britt et al., 1994). • Identifies and retains the core events of the text as separate from substories or anecdotes. • Doesn't understand the context of primary sources or the archaic language in which they are often written. • Understands the context of primary sources and applies vocabulary and comprehension strategies to figure out archaic language. • Doesn't question the writer's assumptions or intentions, reading only to discern facts. • Continually questions the writer's ideas, assumptions, background, and biases. After finishing a text, fluent readers begin to reflect on what they have read. Fluent readers continue to monitor their comprehension to decide whether to reread parts that may still be confusing or unclear. With informational texts, they may begin to question the validity and reliability of main points or persuasive arguments. Fluent readers may question sources and do further research about the topic. Figure 1.3 compares the skills that fluent readers use after reading with those lacking in a struggling reader. • Doesn't reread any passages that are unclear. • Returns to the text to reread difficult passages or graphics and clarifies their meaning. • Doesn't analyze the author's viewpoints to see if the ideas are well supported. • Questions the viewpoints of the author regarding the support given through facts and evidence. • Doesn't reflect on the text to draw conclusions about the author's viewpoints. • Uses facts and opinions expressed by the author to draw conclusions about the author's views. • Sees the textbook as containing a sequence of accurate historical facts that must be memorized. • Understands that historical facts are open to interpretation. • Doesn't evaluate the author's views against other sources and personal viewpoints. • Evaluates the author's views and compares them against other sources and personal viewpoints. • Doesn't pay attention to sources of information and doesn't question the veracity of the information. • Evaluates the sources cited by authors as to their reliability. Obviously, when the entire reading process is considered, struggling readers may lack skills and strategies needed to make literal sense of texts. However, even if readers have acquired these skills and can read fluently, they still may not be able to read critically, especially with historical texts. Reading history as an expert means acting as an investigator who attempts to reconstruct the past from multiple documents, all of which have their own subtexts. Many social studies teachers are changing the focus of teaching history from a set of known facts to a process of investigation, modeled on how actual historians work. Students are learning that history is open to interpretation. Students are being taught to approach history like historians who analyze multiple primary and secondary sources and artifacts related to a single event, questioning earlier conclusions drawn from them. As Wineburg and Martin (2004) note in Educational Leadership, “The place to teach students to ask questions about truth and evidence in our digital age is the history and social studies classroom, and we should not delay” (p. 42). Using multiple documents poses another set of challenges for readers, however. Some students are unable to use the organizational patterns of historical texts to promote comprehension. Textbooks may be mostly narrative, using a combination of structures: chronological, sequential, and cause-and-effect (Britt et al., 1994). The primary purpose of the textbook is to impart factual information. Primary and secondary sources, on the other hand, may have very different structures and purposes. These documents are often created in some rhetorical format, such as propaganda leaflets, political notices, essays, memoirs, journals, or cartoons. Texts such as these may not have main ideas explicitly stated, and the relationships between ideas may not be clearly expressed. Numerous studies by Armbruster (1996) have shown that comprehension weakens when main ideas are not clearly stated or when irrelevant details are included. The writer's purpose can influence the organizational structure of a document. For example, a propaganda leaflet may use a compare/contrast structure to illustrate opposing viewpoints. Primary and secondary sources may vary from the sequential narrative form that students see in textbooks, instead using structures such as problem/solution, main idea with supporting details, or compare/contrast. When students do not recognize a text's structure, their comprehension is impaired. Reading researchers have shown that successful learners use text structures, or “frames,” to guide their learning (Armbruster & Anderson, 1984; Buehl, 2001; Jones, Palincsar, Ogle, & Carr, 1987). Students who identify basic text structures and graphically depict the relationships among ideas improve both comprehension and recall (Armbruster & Anderson, 1984; RAND Reading Study Group, 2003). For example, a fluent reader who recognizes a problem stated in a text will begin looking for a solution. The use of a variety of documents, rather than one textbook, requires additional cognitive skills of the reader. As Britt and colleagues (1994) note, “Students must consider the conditions in which [the documents] were produced (by whom, when, for what audience). Thus, students have to be aware of the source information provided with the documents, in addition to their context” (p. 71). Also, rather than unquestioningly accepting facts, as students often do with their textbooks, readers of multiple documents often face different interpretations of the same event based on contradictory evidence. The documents themselves also have varying degrees of reference; for example, a secondary source may refer to a primary source. Hence, a student must be able to mentally organize a large amount of disparate and conflicting information and make literal sense out of it. Sam Wineburg (2001) notes that true historians comprehend a subtext on the literal, inferred, and critical levels. These subtexts include what the writer is saying literally but also any possible biases and unconscious assumptions the writer has about the world. Historians “try to reconstruct authors' purposes, intentions, and goals” as well as understand authors' “assumptions, world view, and beliefs” (pp. 65–66). As noted, Wineburg calls readers who believe exactly what they read “mock” readers. “Actual” readers take a critical and skeptical stance toward the text. Based on Wineburg's work at Stanford, Judy Lightfoot has constructed a chart detailing the characteristics of an expert reader of history versus a novice reader. With her kind permission, that chart is reprinted as Figure 1.4. Seek to discover context and know content. Seek only to know content. Ask what the text does (purpose). Ask what the text says (“facts”). Understand the subtexts of the writer's language. Understand the literal meanings of the writer's language. See any text as a construction of a vision of the world. See texts as a description of the world. See texts as made by persons with a view of events. See texts as accounts of what really happened. Consider textbooks less trustworthy than other kinds of documents. Consider textbooks very trustworthy sources. Assume neutrality, objectivity in texts. Consider word choice (connotation, denotation) and tone. Ignore word choice and tone. Read to gather lots of information. Resurrect texts, like a magician. Process texts, like a computer. Compare texts to judge different, perhaps divergent accounts of the same event or topic. Get interested in contradictions, ambiguity. Resolve or ignore contradictions, ambiguity. Read like witnesses to living, evolving events. Read like seekers of solid facts. Read like lawyers making a case. Read like jurors listening to a case someone made. Acknowledge uncertainty and complexity in the reading with qualifiers and concessions. Communicate “the truth” of the reading, sounding as certain as possible. Source: From Judy Lightfoot, “Outline of Sam Wineburg's Central Arguments in ‘On the Reading of Historical Texts.’” Available: http://home.earthlink.net/~judylightfoot/Wineburg.html. Based on “On the Reading of Historical Texts: Notes on the Breach Between School and Academy,” by Samuel Wineburg, American Educational Research Journal, Fall 1991, pp. 495–519. As we've shown, becoming a critical reader and thinker involves acquiring a number of skills and strategies. What, then, can social studies teachers do to help students comprehend the literal meaning and also read as an expert historian? The rest of this book is filled with strategies that can help students become better readers. One way to begin is with a Scavenger Hunt. At the beginning of the year, Mr. Reaf might show his students how to survey the table of contents of their textbook by using a Scavenger Hunt. A Table of Contents Scavenger Hunt requires students to preview what they will cover during the course (see Figure 1.5 for an example). Later during the first quarter, Mr. Reaf can show his students how to survey the beginning of a chapter to identify key ideas and terms to be covered. How many chapters are in your textbook? There are 32 chapters in the book. The chapters are organized into larger units. Write the titles of the units below. Turn to Unit 1 on page viii. What two types of strategies are taught at the beginning of the book? What handbook is provided at the beginning of the book, and why is this important? Geography Handbook. Because history is directly related to place. Who do you think the “Three Worlds” are that will meet in Unit 1? Chapters contain special features that are printed in blue print. What three special features do you find in Chapter 1? In which chapter and time period of years will you learn about the 13 colonies? Using the pictures in the margins of the page, in which unit does George Washington appear? In which chapter will you find the Declaration of Independence, and why is it called a “primary source”? Chapter 6; it is a primary source because it is an original document. What two special handbooks do you see in Chapter 8? In which chapters do you learn about the Civil War, and whose picture is presented? Who is pictured in the chapter entitled “Changes in American Life”? You will read about four different wars from Chapter 24 to the end of the book. List the chapters and the names of the wars. What might you learn about in the chapter entitled “The Civil Rights Era”? You will learn about the struggle to bring equality to African Americans. Which special section in the back of the book interests you the most? Authors' note: Figure is based on Creating America: A History of the United States. © McDougal Littell, 2002. 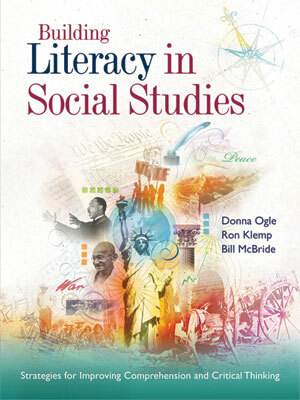 Doty, Cameron, and Barton (2003) state that “teaching reading in social studies is not so much about teaching students basic reading skills as it is about teaching students how to use reading as a tool of thinking and learning” (p. 1). Going back to the scenario that opened this chapter, with Mr. Reaf and Carlos Hernandez staring blankly at each other on the first day of school, perhaps the first change the teacher may want to make is to find a way to engage Carlos and his peers. John Reaf watched the students crowding through the door of his U.S. History class, smiling at their faces, which reflected a variety of ethnic backgrounds. The first day of school—always a challenge. How to show students that they are expected to participate and at the same time make them feel successful? He looked out at the expectant faces as the last two students found seats. A number of hands shot up in the air. Mr. Reaf chose a tall Hispanic boy sitting in the back corner. He walked back to the boy's desk, watching the boy's eyes widen as he approached him. Mr. Reaf reached out his hand. The boy just stared for a moment. Then he shook the teacher's hand, smiling. A number of students laughed at Mr. Reaf's remark. Carlos thought for a second. Mr. Reaf lifted up a copy of the new text from Carlos's desk. The eyes of many students widened at this point. No one moved. The class just stared at Mr. Reaf. Everyone quickly chose the person sitting next to, in front of, or behind them. Mr. Reaf had learned to give students a choice whenever possible, especially at the beginning of an assignment. He knew that having a choice makes students feel empowered, gets them into the activity, and often bypasses that potential discipline problem when a student refuses to take part. He also wanted to see whom they wanted to work with and how they worked together. When he reorganized the classroom later, he'd want to know which few should be separated. Mr. Reaf walked back to his desk and grabbed a stack of handouts. A small girl in the front raised her hand. “Excellent. I'm Mr. Reaf, by the way.” Mr. Reaf held out his hand. The students laughed as Andrea shook his hand and said her name. “The whole book?” someone called out. No one said anything, so Mr. Reaf began to pass out the two-page Scavenger Hunt sheet. Mr. Reaf kept passing out the papers, one to a pair. A boy in the far left row raised his hand. His partner groaned and hid his head on his desk. Mr. Reaf walked over to him and put out his hand. Everyone laughed as the boy introduced himself as Thomas. The students huddled together over their books as Mr. Reaf began to move around the room. Occasionally he stopped to hear a student read, making mental notes of who was struggling and who wasn't. After a few minutes, he looked over the class from the back of the room. Everyone was on task. Well, at least he had them working today. This seemed to be one of his biggest challenges with today's kids—keeping them engaged in any activity. He looked up at the class.